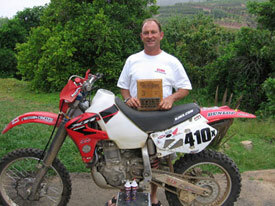 ENSENADA, Mexico June 8, 2006 – Before nearly 200,000 race fans, the Brett Helm/Chris Steward team rode to a 3rd place finish in Class 40 at the Tecate SCORE Baja 500, with a time of 11:04:18 on a Honda XR650R treated with the Ride-On Tire Protection System (TPS) motorcycle tire sealant. 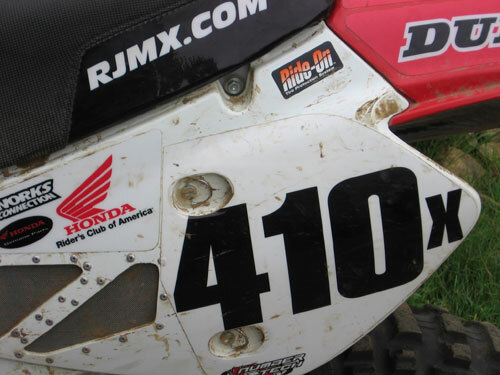 The race featured a race-record 438 starters, from 28 US states, Mexico, Canada, Colombia, France, New Zealand and Japan, for Round 3 of the world-renowned six-race 2006 SCORE Desert Series. The large field, competing in 25 Pro and 6 Sportsman classes for cars, trucks, motorcycles and ATVs, was the largest in the storied history of the summer desert classic, easily eclipsing the event record of 384 starters set in 1976. It is also the largest starting field in the three-decade-plus history for SCORE race in Mexico and second-most in the history of SCORE. Since 1993, Nancy Emde and Chris Steward have operated Trail Boss Tours, an off-road adventure company that provides fun, safe and enjoyable vacations for novices and advanced riders. Trail Boss Tours offers exciting trips in areas such as Baja, Northwest Arizona, the California Lost Coast, the High Sierra and the Mojave Desert. Visit them on the web at www.trailbosstours.com.